Bernard Allison is a guitarist with a pedigree. As the son of the late blues guitar wizard, Luther Allison, Bernard has had some big shoes to fill. 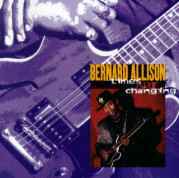 No doubt, in his past, he has had to suffer through comparisons with his famous father and, subsequently had to deal with criticism because he sounded too much like Luther, not enough like Luther, etc., etc., etc.... Times ARE Changing is Bernard's follow-up to his American debut CD, Keepin' The Blues Alive on Cannonball Records. I am the first to admit that I wasn't too excited about Bernard's first CD. Although it was a good effort, I just wasn't sure that he had the fire that his father had displayed for so many years. Not that he needed to sound or act like Luther, he just needed to show the emotion that had graced so many of Luther's recordings, especially those that Bernard played on with his father. Well, times are changing and Bernard's latest CD is one uniformly excellent recording. I have seen Bernard live on three separate occasions and he gets better with each appearance. The same can be said about his recordings. Times ARE Changing is infinitely superior to Keepin' The Blues Alive, and demonstrates all the talent, emotion and fire of any recording that I have ever listened to, including Luther's. The CD features thirteen songs, including seven originals by Bernard Allison (if you consider the acoustic and electric version of "Don't Be Confused" as two different songs. The recording also includes three songs by Luther Allison and one each by Bobby Rush, Sly Stone and Johnny "Guitar" Watson. From the opening Bernard Allison original, "I Can't Get You Out Of My Mind", the CD demonstrates the exceptional talents of Bernard and characterizes his love for his father and for the music that they shared. In fact, on "Bad Love," a Luther Allison and James Solberg penned tune, Bernard sounds so much like his father, it is absolutely frightening. His guitar, his voice and everything else about the sound scream Luther's name to the listener. One of the most significant tunes on the CD is another original tune entitled, "Don't Be Confused." There are two versions of the song on the CD and, in my opinion, the acoustic version is clearly the best because the vocals and lyrics are brought to the forefront of the piece. "Don't Be Confused" is about the life, death and afterlife of Luther Allison and displays just how strong the relationship was between father and son. Having met and talked to both men, listening to this song absolutely brings tears to my eyes; it is VERY powerful. The CD finishes up with the electric version of "Don't Be Confused," which is still an excellent song, but does not seem as emotional as the acoustic version. Other highlights of the recording include "The Way Love Was Meant To Be," another Bernard Allison original that features some excellent guitar. Sly Stone's, "If You Want Me To Stay," is a song I loved when it was recorded by Sly and the Family Stone, and one I have started to love again thanks to Bernard's excellent cover. Also well done, and of note, is Allison's version of Johnny "Guitar" Watson's, "Real Mother Fa Ya," where Bernard further demonstrates his ability to get funky. Bernard Allison is definitely a new force to be reckoned with in the blues world. Because of his pedigree, but even more because of his incredible talent, it is safe to say that we all will be hearing great things from Bernard in the future. This CD demonstrates his current talent and suggests that there are even better things to come. This review is copyright © 1999 by Dave "Doc" Piltz and Blues On Stage, all rights reserved.